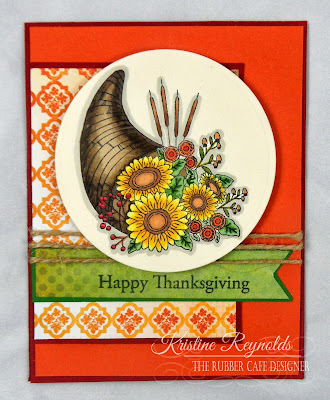 I am totally in love with The Rubber Cafe October Creative Cafe Kit of the Month- Harvest Time! Have you seen it yet? It is full of beautiful Bo Bunny patterned papers- "Autumn Song", a beautiful fall stamp set, and lots of yummy embellishments including ribbon, burlap, sequins, and twine! I can not wait to see what the rest of the design team makes with their kits. 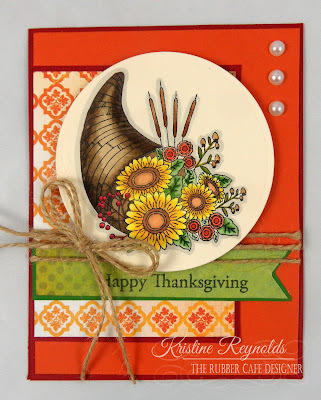 Here is the first card that I made using items from this months Creative Cafe Kit of the Month. 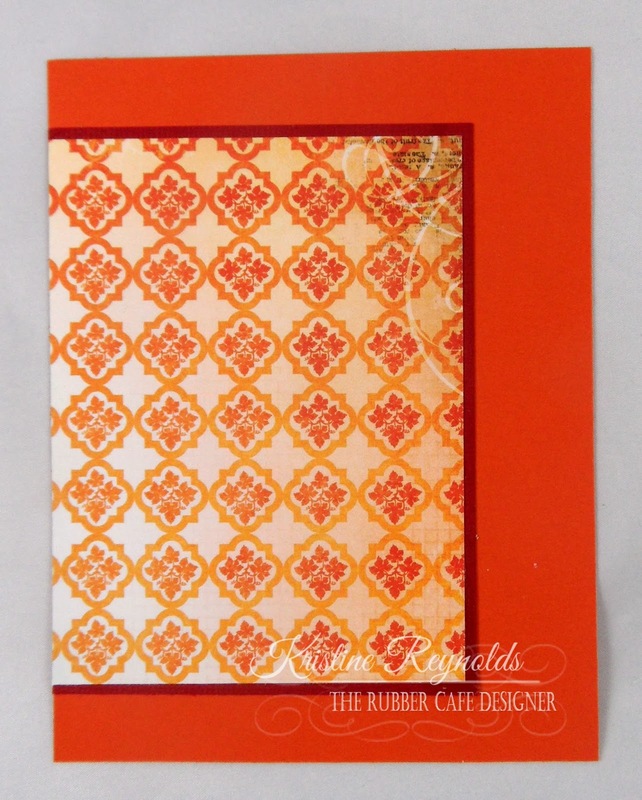 To make this card I started by adhering a 4 1/8" x 3 1/8" panel of patterned paper to a 4 1/4"x 3 1/4" panel of burgundy cardstock and then adhered the completed panel to a 5 1/4" x 4" orange panel of cardstock using Scrap Happy Glue. I cut a 3/4" strip of patterned paper and trimmed the ends to create my label panel. I backed it with green cardstock and I stamped the sentiment on the panel with Memento Tuxedo Black dye ink. I wrapped twine around the panel three times and then adhered it to a 5 1/2" x 4 1/4" top folding burgundy card with Scrap Happy Glue. I stamped the cornucopia image on a cream die cut circle panel with Memento Tuxedo Black ink and colored it with Copic Markers. They I adhered the image panel to the card with 3D Foam Squares. The final step was to add three pearls to the top right corner and attach the twine bow to the card with Scrap Happy Glue. 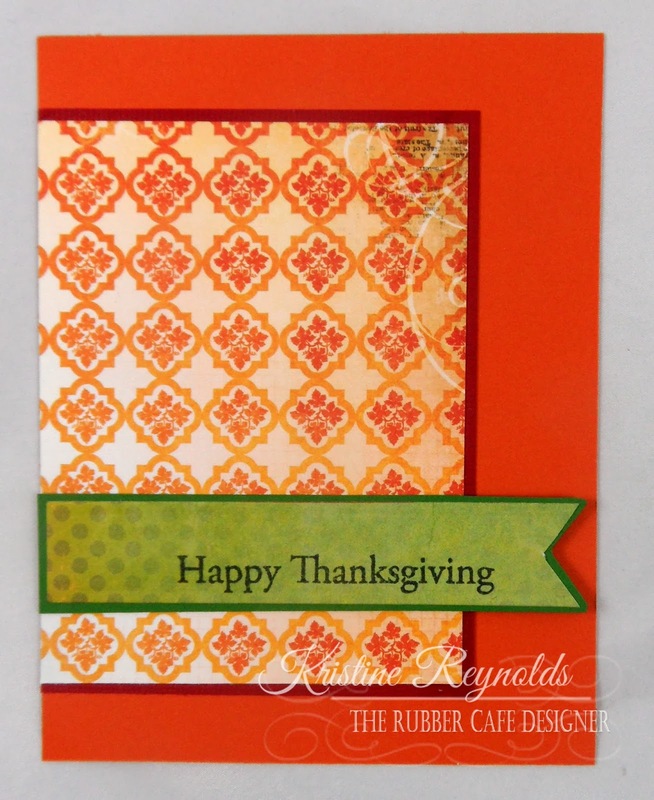 I hope my card gives you some inspiration to use your October Creative Cafe Kit of the Month. Don't have one??? 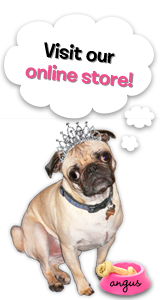 Well...hopefully you are on your way to the web site to order one now...you won't be disapointed! Be sure to check back all month long for ideas and inspiration from the entire design team! 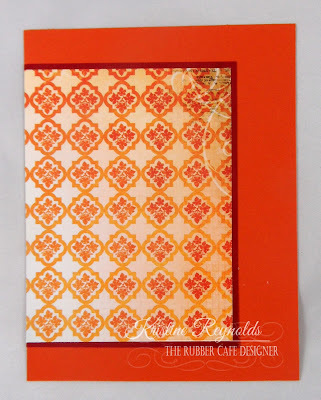 Adhesive: The Rubber Cafe' - Scrap Happy Glue, 3D Foam Squares. This is beautiful - your coloring is amazing! Just love the design of this card! So pretty!